Well, it’s been a busy day away from Bloggiesta today. Mags and I went to eat at her favorite restaurant, The White House. We read a bit of Fruits Basket volume 5, then went to the library for their showing of Cloudy With a Chance of Meatballs. It was a cute enough movie, but I wanted to leave more than once. It’s just… IDK… childish? annoying? I did, however, love the monkey, Steve, as well as the police officer who I think was voiced by Mr. T. I had to laugh when I said, “Hey, that’s Mr. T!” and Maggie said, “Who?” I remember a time when the answer would have been to either do my best “I pity da foo'”, or say “B.A. Baracus”, however today my answer was, “You know, the Night Elf Mohawk.” Ooh, yeah… lol. I picked up some books for The Welsh Reading Challenge, too, and then we were off to the grocery store for the ingredients for Taco Casserole, which I ended up NOT making because I was too dang tired. We stopped at Hardee’s for an industrial sized cup of coffee for me and a hot chocolate for Mags. We sat there and finished Fruits Basket, for which I’ll write a review and schedule it for later. I’m hoping to manage to get at least 3 more mini-challenges done tonight before going to bed, and then hopefully finish them all tomorrow. So first challenge tonight at Emily’s Reading Room. It’s about setting up Google Alerts to keep track of trends in searching for topics to do with your blog. 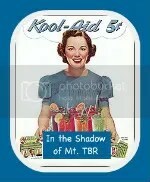 Personally, I wasn’t exactly sure what to do for me, so I set up a couple with “The Kool-Aid Mom, thekoolaidmom, In the Shadow of Mt. TBR, Mt. 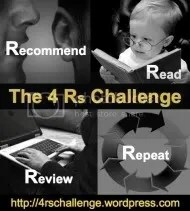 TBR, and Welsh Reading Challenge”. It’ll be interesting to see what happens. According to @pussreboots and @bookladysblog, it also lets you know when the phrases you put in the alert are mentioned on the web, whether they link to you or not. In the Shadow of Mt. TBR is a fun and informative blog where The Kool-Aid Mom reviews books, posts humorous memes, occasionally rants, and has fits of ADD randomness. Come on over and sit a spell in the shade, have a good laugh and contiue on your Web-browsing journey feeling refreshed! Was kinda tough to write, but I’ll be surprised if I ever remember it when someone asks about my blog… lol. Get back to posting daily, whether a review, meme, or random post. I had gotten distracted by playing the computer games, and got out of the habit. I plan to make a monthly reading plan and sticking to it. I made one for January, but I’m already starting to whine and want to cheat… there’s just SoOoOOoo many good books out there! But I really WANT to make the ARC-alanche pile disappear, so I’m staying with it. Okay, so now I’m onto my fourth mini-challenge and that’s with Bookalicio.us’s Bloggiesta Mini Challenge: Footers. I caught some chatter about this one on Twitter last night and wanted to make sure I got it done. To be honest, I’ve never done anything copyright related, so this is a completely new thing for me. *tick-tock… time passes… spring, summer, fall, winter…I now have a headache…* I don’t know how to do this stuff. It looks like I have to pay for the copyright thing, and I can’t figure out how to do a footer. I’ve looked all up and down the control panel in my dashboard, and I can’t find a thing to do a footer. I can’t figure out how or where the plug-ing for it is, and even if I could, I think I tried to do some WP plug-in once before and found out I had to upgrade my account to use them. I give up… I think I’ll go lie down and watched Stargate for a while. ***edit*** I added a Copyright widget, so I got it worked out. I’m gonna do the feedburner, too.